A superb gift for a lady or gentleman. You can choose to have this hanky personalised with initials, a name or a little message. A superb gift for a lady or gentleman. You can choose to have this hanky personalised with initials, a name or a little message. Just fill in the option box and choose what colour embroidery thread you would like us to use. We offer as standard a mens or ladies size white cotton handkerchief. OR if you require the most luxurious fabric we offer pure Irish linen handkerchief - mens punch hemstitched handkerchief measuring 42cm x 42cm or ladies linen with lace trim handkerchief measuring 28 x 28cm. 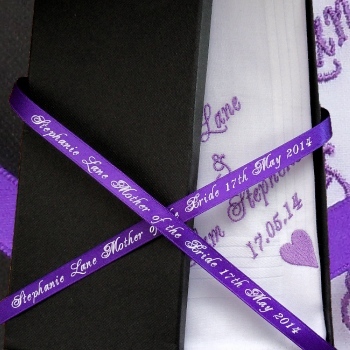 This embroidered handkerchief comes in a gift presentation box complete with a personalised printed satin ribbon tied around. Please enter the wording you would like on the ribbon. This can indicate who the gift is to and from or perhaps a simple little message such as Happy Birthday!